American colleagues often say Europe is about proprietary distribution via bank networks, while the US is all rough-and-tumble, survival-of-the-fittest open architecture. They point to the disproportionate share of fund flows that go to bank-owned asset managers in some of Europe’s largest markets, notably Germany and Italy, and the US’s predominantly third-party marketplace. In the US in the mid-2000s, the big full-service wealth managers had sizeable asset management units that pushed their products largely internally. But starting in 2005, many were offloaded due to regulatory pressure (ie, the conflict of an adviser recommending their own firm’s more profitable product over an outside one) as well as in response to the financial crisis. Merrill Lynch sold its money management business to BlackRock while Morgan Stanley offloaded Van Kampen to Invesco. Few US asset managers sold direct to retail consumers and the overwhelming majority of flows were via intermediaries. There were a few exceptions, including Fidelity, Vanguard and T Rowe Price, but in general the roles were clearly defined: the asset managers, as “manufacturers” sold on a wholesale basis to the broker-dealers, the “distributors” that owned the retail relationships. A similar, stark demarcation existed in the institutional arena: asset managers forged relationships with investment consultants who, in turn, advised public and private pension funds. Now the lines have blurred due to developments including the growth of passively run ETFs and downward pressure on fees, greater regulation and technology. Even so, little attention is paid to how the various players increasingly sidle on to each other’s turf and the implications of that. More and more, the companies that own the relationship with end-investors focus on expanding their own asset management capability — a reversal of the accepted wisdom at the time of the financial crisis. Examples abound, including Raymond James’ Carillon Tower Advisers arm, Edward Jones’ rapidly growing Bridge Builder fund line-up, and Charles Schwab’s Laudus funds. The point is best made by looking at Morgan Stanley and its Morgan Stanley Investment Management business. James Gorman, Morgan Stanley chief executive, has said he intends to double the size of MSIM to at least $1tn in assets, and that selling Van Kampen was a strategic mistake. Not unrelatedly, more asset managers have forged relationships with end investors and sell directly to them. The size of direct-to-consumer businesses at Fidelity and Vanguard has grown dramatically, while in December BlackRock and Microsoft announced a partnership to bring technology-based investment and planning solutions to address America’s vexing retirement savings shortfall. Details of this venture are scant but my bet is it will involve investors being offered BlackRock products and services on a direct basis supported by a seamless technology platform developed by Microsoft. The industry is seeing the change. According to Strategic Insight, of the top 10 asset managers in the US ranked by 2018 net inflows, five are either part of an institution that owns the client relationship or are companies that primarily sell direct to the consumer (not counting MSIM in 11th place). Some of this reflects a tug of war over shrinking revenues associated with managing portfolios of investors of all stripes. As with any industry, if the ultimate price the customer is willing to pay shrinks, providers need to cut costs to preserve margins. Wealth managers have shrunk the shelf space for outside managers and increased the price of entry to their systems, in addition to slowly taking on asset management activities. Likewise, asset managers have sought out new ways to distribute their capabilities. Is all this a cause for concern? Do regulators need to save investors from conniving asset and wealth managers driven to bend fiduciary obligations? Time will tell, and no doubt there will be some bad actors. Most of these developments, however, serve to lower the cost borne by investors, and the response to declining margins will more often be the consolidation of small and midsized providers, rather than anything nefarious. There is no doubt that the environment is now more complex for asset managers. Chief executives will have to put more focus on corporate strategy and how to deploy finite resources. Some will be up for the challenge while others will wither, probably to be acquired. Squint just right and the US asset management industry is beginning to resemble that of Europe. Although Donald Trump is not the first US president to have reservations about America's spies, he is the first to attack the intelligence community so openly. As US intelligence analysts' job becomes ever more difficult, other national-security policymakers must support them in providing in-depth, fact-based assessments. 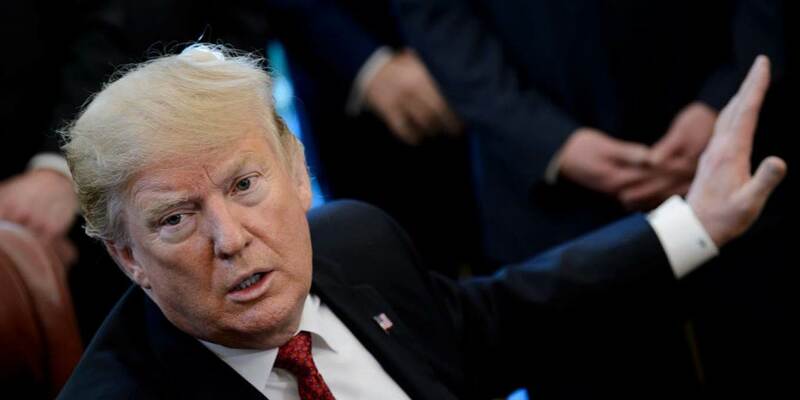 ATLANTA – For more than two years, US President Donald Trump has heaped praise on the world’s authoritarians, disrespected America’s democratic allies, and pursued an ego-driven effort to solve the Gordian knot of North Korea’s nuclear weapons program. But now, the effects of Trump’s demented foreign policies are coming home to roost. Nowhere is this more evident than in the United States’ intelligence agencies, where professionals charged with safeguarding the country’s national security are struggling to acquaint the president with realities he does not want to see. Following the annual threat briefing to Congress in January, Trump issued a flurry of tweets challenging the credibility of his own intelligence chiefs’ testimony. Though the content of these tweets was characteristically sophomoric, it would be a mistake to dismiss them as a mere tantrum from the Toddler in Chief. Trump’s petulance bears directly on the intelligence community’s ability to do its job. Trump’s intent in undermining his own intelligence chiefs is hard to miss. Unnamed White House sources recently suggested to reporters that Trump is eager to be rid of Dan Coats, the director of national intelligence. By quickly dismissing reports about intelligence officials’ testimony as “fake news,” Trump delivered an important message to Coats: his job depends not on his performance, but on his willingness to carry water for the president. Of course, all presidents appoint their top spies and periodically make changes within the ranks of the intelligence community. Generally, questions of who briefs the president or offers advice on risky covert actions receive the most public attention. But historically, the intangibles that shape such relationships – not least the president’s personal views about intelligence – have had the most dramatic effect on how intelligence is used. For example, Richard Nixon regarded the CIA’s top officials as enemies, and thus kept the agency in the dark about his strategic plans. Similarly, when intelligence analysts raised their estimate of North Korea’s military strength, Jimmy Carter suspected they were plotting to derail his campaign pledge to bring a US Army division home from South Korea. And Bill Clinton, for his part, simply wasn’t interested in spies and their business. After a small plane crash near the White House in 1994, many joked that it was an attempt by the CIA director to get in the president’s door. But Trump has broken new ground with his public attacks on US intelligence agencies. The problem probably started when those agencies unanimously concluded that Russia had waged a cyber and political war to put Trump in the White House. And intelligence agencies certainly haven’t helped themselves by repeatedly contradicting Trump’s off-the-cuff pronouncements on Iran, North Korea, the Islamic State (ISIS), and other threats. Yet even putting these instances aside, Trump came to office with a deep and abiding ignorance of national-security policy and the role intelligence plays in it, which means that the situation for US spy chiefs is not going to improve. Consider the analysts who are responsible for assessing developments in North Korea. Like their colleagues who monitor other threats, they aren’t there to criticize US policy or tell policymakers what to do. Their role is to consider intelligence from all available sources, and then assess the likely effects of potential US action across a wide range of strategic areas. But Trump has not been happy with US intelligence analysts’ latest findings. North Korea’s recent threat to resume missile testing would seem to reinforce the judgment that the country’s leader, Kim Jong-un, is nowhere close to giving up his nuclear arsenal. Yet the response to that news from Secretary of State Mike Pompeo, a reliable Trump weathervane, was to dismiss North Korea’s own official statement and reaffirm the administration’s faith in Kim. Those briefing Trump on the actual intelligence should consider themselves warned not to expect praise for doing their job. After all, assessments of the North Korea threat will undoubtedly continue to invite Trump’s ire. Trump’s recent summit with Kim in Hanoi was a failure, and the effort to denuclearize the Korean Peninsula has gone nowhere. At the same time, Kim has made significant progress in bolstering his own position. With international support for sanctions weakening, China has begun to allow more cross-border trade, offering an economic lifeline for the Kim regime. Kim has also managed to secure a suspension of major US military exercises on the peninsula, while driving a wedge between the US and South Korea. With or without a nuclear deal, South Korean President Moon Jae-in’s own political future requires that he pursue further North-South rapprochement, while playing Cupid to Trump and Kim’s bromance. Whether Trump will sit still for an uncongenial intelligence assessment is anybody’s guess. In public, Coats and CIA Director Gina Haspel insist that Trump is an engaged, informed consumer of intelligence. But such claims are refuted by the fact that Trump himself has dismissed the need for daily briefings and repeatedly rejected established facts and contrary opinions. With in-person briefings already down to just two per week, those who conduct them have reportedly begun playing to his limited attention span by focusing more on business and trade. America’s intelligence chiefs are obliged to present the president with the facts, whether he likes it or not. Anything less shortchanges the people who work hard to collect and assess intelligence. Worse still, it amounts to a major threat to US national security. Kent Harrington, a former senior CIA analyst, served as National Intelligence Officer for East Asia, Chief of Station in Asia, and the CIA’s Director of Public Affairs. New missiles and large-scale exercises part of long-term strategy to deter Beijing. FORT SHAFTER, Hawaii—As an organization based solidly on dry land, the U.S. Army’s increasing focus on the Pacific might seem puzzling to some. But with China continuing to expand its military, building islands in the South China Sea, and spreading fear among neighbors, the Army wants to up its game in the region with more firepower and additional rotations of U.S. troops—not only to reassure key U.S. allies such as Japan, South Korea, and Thailand that the United States has their back, but also to prevent a potential war. “China is the priority,” said Gen. Robert Brown, U.S. Army Pacific commander, during a March 19 roundtable with a handful of reporters at Fort Shafter in Hawaii. The push to ramp up presence in the Pacific is in line with the U.S. military’s strategic shift from the counterterrorism fight in the Middle East to competition with potential near-peer adversaries such as Russia and China. Former Secretary of Defense James Mattis laid out the approach in a National Defense Strategy last year. “We’re kind of at an inflection point,” said Army Vice Chief of Staff James McConville in an interview, citing almost two decades of wars in Iraq and Afghanistan. But the Army’s new road map for countering China is contingent on persuading Congress to fund it. And there are many skeptics on Capitol Hill and in the broader community who are unconvinced that Beijing really poses a military threat to the United States and its allies. Stephen Orlins, the president of the National Committee on U.S.-China Relations, took issue with the Pentagon’s aggressive stance toward China, saying that the area where Washington should really be competing with Beijing is in the economic and diplomatic domains. “What we’re doing, in effect, is we’re demonizing China,” Orlins said during a February event in Washington, D.C. “I don’t disagree that [China is] an economic competitor and a diplomatic competitor. But when we brand them a strategic competitor … that diverts spending from what we really need to compete with China to the strategic side. “What we’re seeing is an exaggeration which has terrible policy consequences for America,” he said. Orlins acknowledged that China’s actions in the South China Sea have violated international law but said that does not mean it poses a “strategic threat” to the United States. For its part, the U.S. military is increasingly concerned not just about China’s efforts to modernize its military, but also about what it sees as Beijing’s underhanded economic practices. Through the Belt and Road Initiative, China is developing infrastructure and investing financially in countries across the world, particularly in its Pacific backyard. But the investment has come with strings attached for some countries, including unsustainable debt, decreased transparency, and a potential loss of control of natural resources. In December 2017, Sri Lanka handed over control of the newly built Hambantota seaport to Beijing with a 99-year lease because Colombo could no longer afford its debt payments to China. Adm. Phil Davidson, the commander of U.S. Indo-Pacific Command, cited the case in an appearance before the Senate last month. “China represents our greatest long-term strategic threat to a free and open Indo-Pacific, and to the United States,” Davidson said. Part of the Army’s efforts to deter China focuses on strengthening alliances and partnerships in the region as a counterweight to Beijing’s increasing influence. This means more rotations of thousands of soldiers at a time from the mainland through short-term Pacific deployments, Brown said during the press conference. The Army already has roughly 85,000 soldiers in the theater, mostly in South Korea, Washington, Alaska, and Hawaii—which is home to the U.S. Indo-Pacific Command’s headquarters. It also potentially means more, larger-scale exercises in the region. In an interview, Army Undersecretary Ryan McCarthy said the service included in its budget request for fiscal year 2020 money to beef up the existing Pacific Pathways exercise—which in its first iterations involved Indonesia, Malaysia, and Japan—and establish a new, division-level exercise called Defender Pacific, designed to show the capability to deploy a much larger force. Another way to strengthen partnerships is through selling foreign militaries U.S. equipment, McCarthy said. “We can teach them and show them and help them grow their capabilities,” he said. But another part of the strategy is building up the Army’s own arsenal in the Pacific. As a land-based service, the way the Army fights in the Pacific is with long-range missiles and artillery—extremely long-range. But the INF Treaty does not cover a new type of weapon, hypersonic missiles, which travel at least five times the speed of sound and could reach 1,000 miles or farther. The Army is hoping to use this fact to its advantage. In this year’s budget request, the service said it is planning to spend more than $1 billion in fiscal year 2020 to develop a land-based hypersonic missile. Meanwhile, the service’s new Strategic Long-Range Cannon could be fitted with a hypersonic round that could travel vast distances. These capabilities could be fielded in 2023, McCarthy said. If the United States withdraws from the INF Treaty, the Army’s Precision Strike Missile, a replacement for the legacy Army Tactical Missile System, could be adjusted to extend its range beyond the current INF Treaty limit of 499 kilometers. That capability could be fielded in 2022. In addition, the Army is currently developing an extended-range artillery cannon, designed to reach up to 70 kilometers, about 40 miles. The Army could potentially position these missiles on any of the Pacific theater’s 25,000 islands, Brown said. In addition, the Army is establishing a “multidomain task force” concept designed to fight on the modern battlefield, which involves not just the traditional air, land, and sea domains, but also cybersecurity and space threats. In a conflict, such a task force would allow the Army to penetrate China’s sophisticated defenses, which push America’s traditional capabilities such as aircraft carriers and non-stealth fighters further from its shores. Finally, the Army is also looking at deploying a Security Force Assistance Brigade a specialized unit designed to train, advise, and assist partner nations, to the Pacific. The Army’s first such units are focused on Afghanistan. McCarthy stressed that the Army currently does not have any concrete plans to deploy the new missiles, task force, or Security Force Assistance Brigade to the Pacific. That decision will ultimately be made by the secretary of defense, in conjunction with the chairman of the Joint Chiefs of Staff and the combatant commander—Davidson—as part of the force allocation process, if leaders ask for those capabilities. But Brown said U.S. allies in the region, even ones with more peaceful postures, such as Japan, are open to the possibility of additional U.S. troops and weapons. “They have reacted in a more positive manner than I’ve ever dreamed of,” said Brown, noting that regional allies have recently been alarmed by North Korea’s missile testing and China’s aggression. “There is tremendous cooperation and excitement, because they have the same dilemma—they are facing a very capable potential adversary. “It’s a huge advantage for us when you look at China, it doesn’t have those types of relationships,” Brown said. Lara Seligman is a staff writer at Foreign Policy. In the fifth installment of this series, I will focus on the origins of the United States and the geographical elements that were critical in defining American politics, strategy and culture. In particular, three geographical features defined the English colonies and helped shape the United States into the country it is today. The first was the long Atlantic coast. Both the Jamestown and Plymouth colonies were funded by British investors who sought to profit from primarily agricultural goods produced along the coast that could be shipped to Britain. Over time, the long coastline allowed for more extensive settlement, the development of a North American shipping industry and an orientation to Europe. The colonies were therefore an extension of Britain not only politically but also economically. The second defining feature was the flow of major rivers in the colonies. In the south, the west-east flow of most rivers from the Appalachians to the Atlantic meant that north-south transportation, and even communication, was difficult. As a result, the southern colonies were isolated from the northern colonies and from each other. They saw themselves as distinct because of the lack of river transport and the lack of a road system, which would have been expensive to build. The northern colonies were less fractured. The rivers there ran north-south, the area was much smaller, overland transportation was much easier and the colonies were less distant and distinct. The third and, by far, most important geographic feature was the Appalachian Mountains. The Appalachians were extraordinarily rugged, not because of their heights but because of their vegetation. The mountains were steep in places, and the vegetation made the area almost impassable except at a few points. It wasn’t until after the American Revolution that passages along the mountain range were forged by men like Daniel Boone. The Appalachians were, until then, the western boundary of both the northern and southern colonies. One of the most important characteristics of the Appalachians is the curve toward the coast as they stretch north of Maryland. It’s here that the terrain of the mountain range becomes much hillier and rockier compared to the south. South of Maryland, the Appalachians are a couple of hundred miles from the coast, and a large, relatively flat plain emerges between them and the Atlantic. Thus, the south, unlike the north, provides perfect conditions for large agricultural undertakings, including plantations. 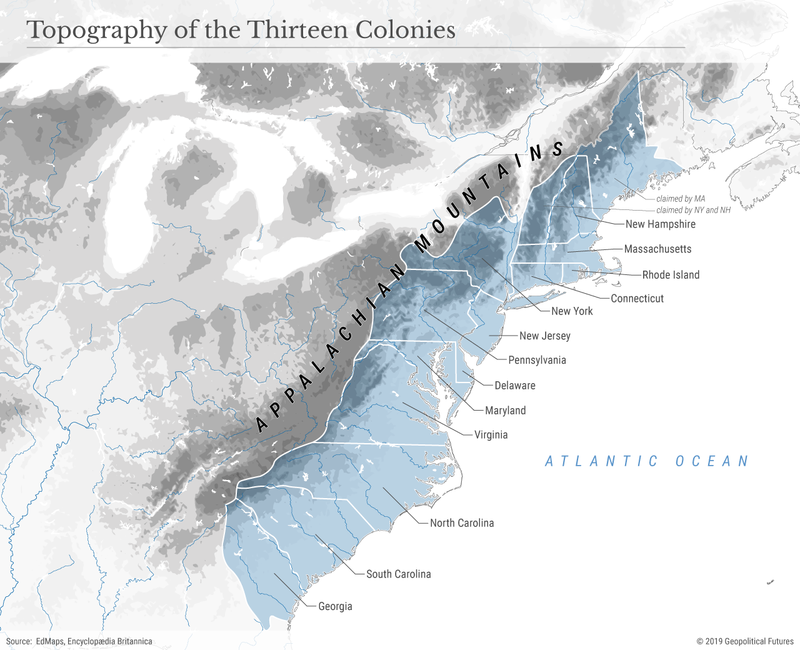 This geographic distinction led to the primordial divide in the colonies. Plantation farming requires low-cost labor. In Europe, this was provided, prior to the Industrial Revolution, by a social system that created a large class of serfs legally bound to the land. But in the colonies, such a system did not exist, and migrants from Europe weren’t willing to take on such a role. The alternative solution was the importation of African slaves. But this solution was applied only in the south. In the north, there was no slavery because the economy couldn’t support it. The economy there was built around small farms, shipbuilding, crafts and finance. The roots of the Civil War were shaped by this geography. The question of slavery was embedded in the different economic and social structures that evolved in the colonies. But before the Civil War, there was the American Revolution, which also turned on the Appalachians. The French, allied with indigenous nations, controlled much of the area west of the Appalachians but didn’t settle there as export of massive agricultural products would have been impossible. They instead traded primarily with indigenous groups for furs. During the Seven Years’ War, called the French and Indian War in the United States, the French sought to cross east, over the Appalachians and into the British colonies. They were stopped by the rugged mountains and also by American militias. British forces, trained for battle on the North European Plain, could not manage combat in the Appalachians, though they held the colonial troops in contempt for the way they fought while also suffering disastrous defeats themselves. That was the moment that the concept of America as a distinct nation was forged. Americans like George Washington realized that the defense of the colonies depended on them and that the British were of little help and much annoyance. At the same time, they knew an economic break with Britain was impossible but, if it did occur, it could not be on British terms. They also knew they couldn’t protect the long Atlantic coast against the British navy. To have any chance of survival, they had to build many roads running north to south so they could mass a defense along the length of the colonies. Geography has thus defined much of America’s history – both during and after the colonial era. The story I laid out here is obviously incomplete; it’s not intended to be the definitive history of the colonies by any means. But it is intended to begin to show geography’s effect on history. As always, this is just a fragment of the full story. As police converged on his home in Lima on Wednesday, former Peruvian president Alan García shot himself in the head rather than submit to arrest in a corruption case. His death, hours later, was the latest tragic chapter of a long tale of graft scandals in the Latin American country. The past five presidents, who together governed for 33 years, have each been investigated or jailed for corruption. Current president Martin Vizcarra took power last year on a promise to clean up politics following the gargantuan Odebrecht corruption scandal which implicated four of the former leaders. One, Ollanta Humala, is in Lima awaiting trial. Another, 80-year-old Pedro Pablo Kuczynski, is in intensive care with high blood pressure after being arrested last week. A third, Alejandro Toledo, is on the run in the US where he spent a night in a police cell last month for being drunk in public. Prosecutors believe the fourth, Mr García, received more than $100,000 in kickbacks from Odebrecht, a Brazilian construction company, during his second spell as president from 2006 to 2011. He denied the charges. “I never sold myself, and that’s been proven,” he wrote on Tuesday in his final tweet before his death.Peru, more than any country other than Brazil, has been shaken to its core by the Odebrecht revelations. The company admits it paid nearly $800m in bribes in 12 countries to win contracts for infrastructure projects, some $30m of it in Peru. Some in Peru see the pursuit of the four former leaders as evidence that Peru is more corrupt that its neighbours. Others take the investigations as proof that authorities are doing their job — in contrast to other Latin American countries where progress in the Odebrecht probe has been slow. While corruption scandals have dragged down the economy and hit business sentiment in Brazil, Peru’s economy seems less susceptible to the political and judicial intrigue in Lima. Antonia Eklund, senior analyst at Control Risks, said that while corruption shaved an estimated 0.8 per cent off Peruvian gross domestic product in 2017, in Brazil the figure was 2–3 per cent. Peru’s economy grew 4 per cent last year, compared to Brazil’s 1.1 per cent and South America’s 0.1 per cent, according to the World Bank. It predicts another 3.8 per cent of growth this year and 3.9 per cent in 2020. Running like a Shakespearean subplot below tales of corruption in Peru is the story of the Fujimori family, a powerful and controversial political clan. Alberto Fujimori, the authoritarian ruler from 1990 to 2000, spent 12 years in jail for ordering killings and kidnappings as well as embezzlement, only to be pardoned on health grounds by Mr Kuczynski on Christmas Eve 2017. In a memorable video, Mr Fujimori, dressed in a white hospital gown and connected to tubes, addressed the nation from his hospital bed and asked his detractors “for forgiveness with all my heart”. But the Supreme Court overturned the pardon and the frail 80-year-old was sent back to jail this January. “The end of my life is close,” he tweeted alongside a mournful, handwritten letter posted on his feed. Alberto’s daughter Keiko Fujimori, leader of the opposition, is also in prison, in preventive custody, accused of accepting more than $1m in illegal funding from Odebrecht. Adding sibling rivalry to the family saga, she has distanced herself from her brother Kenji Fujimori, a congressman who quit her party over support for Mr Kuczynski. He said his sister harboured “a criminal attitude” and her party lacked moral authority.